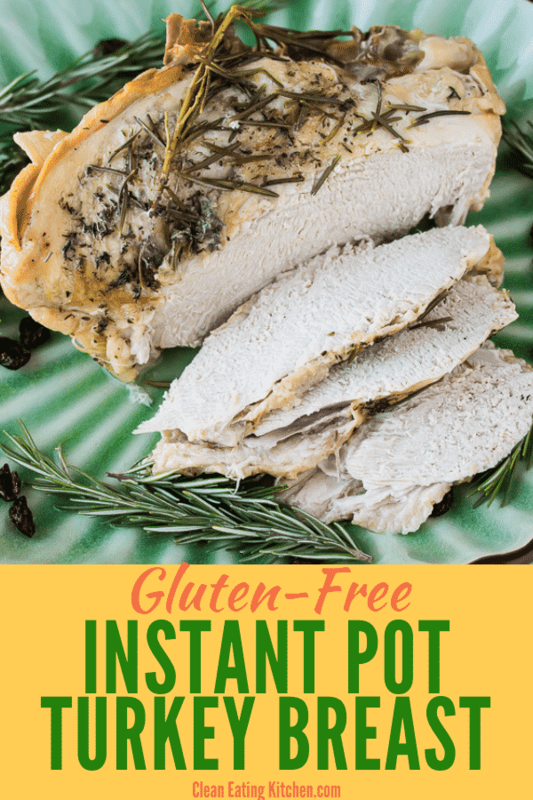 This Instant Pot Turkey Breast is the easiest way to cook turkey, and it essentially makes the gravy at the same time! This recipe is gluten-free, paleo, and Whole30. I set myself a challenge this year to make every Thanksgiving recipe I can in the Instant Pot! Doesn’t that sound like a fun challenge? I mean, who can argue with one pot meals that free up the oven and make for easy clean up? That sounds like a dream to me! I’m thinking I need to make some kind of cornbread-type side dish, plus mashed potatoes, and maybe one more dessert? Let me know if you have a favorite Thanksgiving dish you’d like me to tackle in the Instant Pot pressure cooker. I am looking for a challenge! Today, I present you with my Instant Pot Turkey Breast with Built-in Gravy. This recipe is perfect for smaller gatherings, up to four people. After all, the meal is more about the side dishes and desserts than just the turkey, am I right? You do need to be careful and not get too big of a turkey breast, otherwise it won’t fit in the Instant Pot. I used a 6-quart Instant Pot, and a bone-in turkey breast weighing 2.75 pounds just fit in the pot. 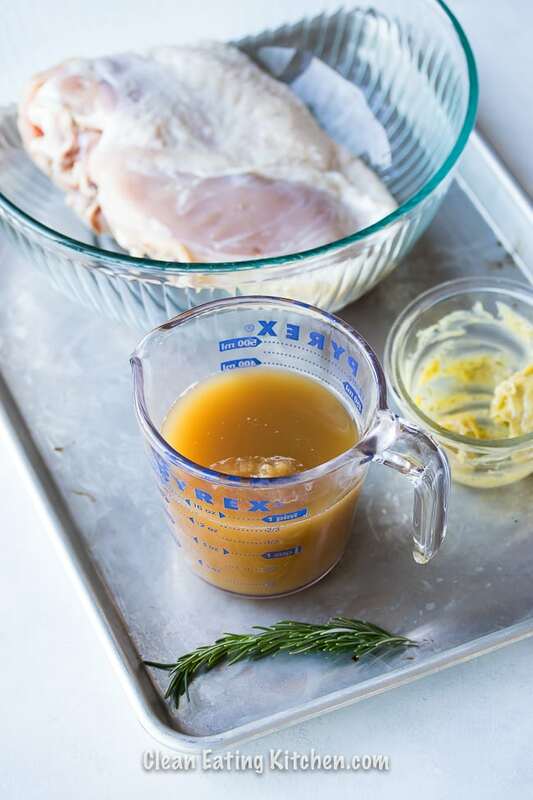 The broth will become your gravy with a few additional steps later on in the cooking process, so be sure to choose a quality broth. There are some amazing brands in the refrigerator sections of natural food stores, so I suggest looking there, as opposed to a shelf-stable variety. 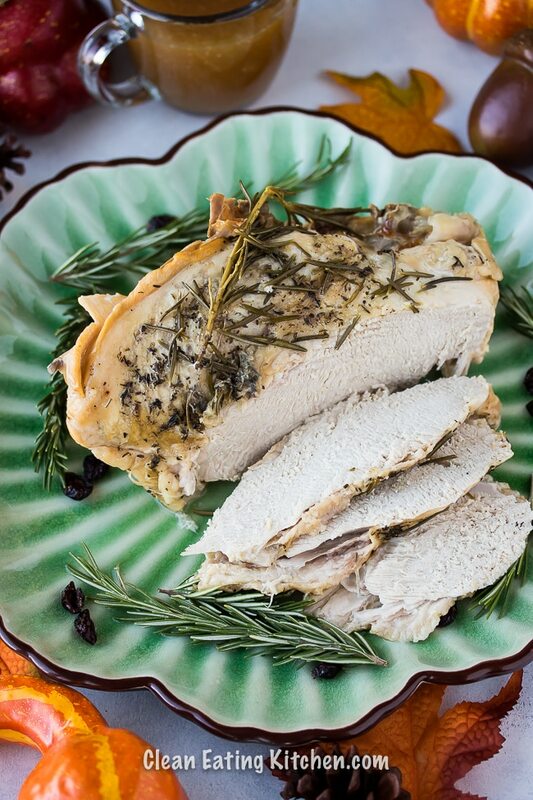 I rubbed the outside of the turkey breast with an herbed ghee I made simply by mixing together room temperature ghee with my favorite herb blend. Some people suggest rubbing the herb blend under the skin, but I get too grossed out to do that. Just being real, you do whatever you want. Add the broth to the base of a 6-quart of 8-quart Instant Pot pressure cooker. Place the metal trivet on top. Next, add the turkey breast on top of the trivet. Use your hands or a spoon to spread the ghee or butter on top. Sprinkle on the dried herb seasoning. Lock on the lid and push the button for pressure cooking. Set the time to 40 minutes. Once the cooking time is complete, let the pressure come down naturally or use the quick-release method. Use tongs to carefully remove the turkey breast to a serving platter. To make the Instant Pot gravy, you need to strain the broth left in the pot. Use a clean stainless colander to strain the gravy. Then, pour the strained gravy back into the Instant Pot and push the button for sauté. Once the gravy is simmering, add the arrowroot powder and use a whisk to combine. Keep whisking the gravy for a few minutes until the flour has dissolved. Let the pot simmer for about 10 minutes to thicken the gravy. Pour the gravy into a serving bowl and serve alongside the turkey. 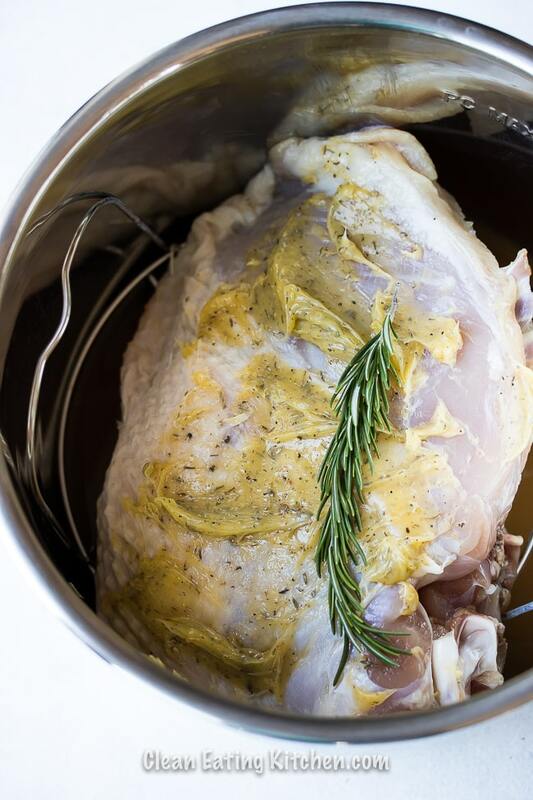 Here’s how to make a turkey breast and gravy in the Instant Pot. Add the broth to the base of a 6-quart of 8-quart Instant Pot pressure cooker. Place the metal trivet on top. Next, add the turkey breast on top of the trivet. Use your hands or a spoon to spread the ghee or butter on top. Sprinkle on the dried herb seasoning. Lock on the lid and push the button for pressure cooking. Set the time to 40 minutes. Once the cooking time is complete, let the pressure come down naturally or use the quick-release method. 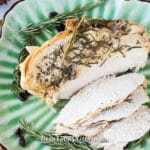 Use tongs to carefully remove the turkey breast to a serving platter. To make the gravy, you need to strain the broth left in the pot. 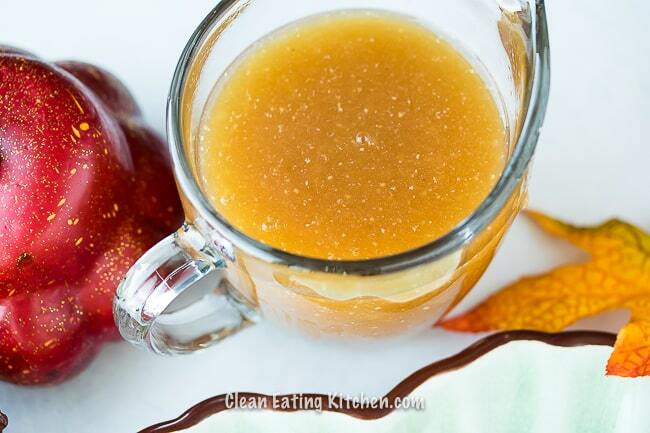 Use a clean stainless colander to strain the gravy. Then, pour the strained gravy back into the Instant Pot and push the button for sauté. Once the gravy is simmering, add the arrowroot powder and use a whisk to combine. Keep whisking the gravy for a few minutes until the flour has dissolved. Let the pot simmer for about 10 minutes to thicken the gravy. That’s a great goal for the Instant Pot! I have a 6 quart and wonder if I’d use it more if I had a 3 quart size (small frig, no freezer and cook for myself). The turkey breast size for a smaller portion in the Instant Pot would work for me though. I used to use arrowroot powder all the time and need to get some more. I’m going to look into your Cranberry Relish Instant Pot recipe since it caught my eye! Thanks! Thanks, Deb! I am having fun playing with my IP. I think you might like a 3-quart IP, but I would suggest just making smaller batches in your 6-quart. The 3-quart is REALLY small. 🙂 XOXO. This recipe sounds delicious and perfect for a small family but I’m having a hard time finding a bone in turkey that small. Where did you find yours? 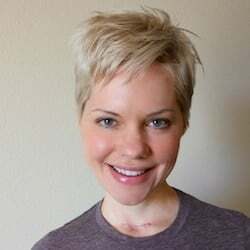 Hi Stephanie! I found mine at Trader Joe’s, but you could always ask the butcher at your local grocery store to order you one. Enjoy!!! Hi hi! This looks soooo yummy. I recently just bought a 1.75lb turkey breast- just be and the hubs😊 what would the time adjustment be on this. Some people say 6 minutes per pound, but I like to cook it longer to make sure it’s cooked through. Enjoy!! !